After our trip, I can say that packing for Paris should be very easy if you follow 2 rules: take every black article of clothing you own and, if you happen to be visiting in the fall, every warm article of clothing you own that fits rule number 1. Fortunately, we weren’t laughed out of the city limits. However, we were faced with an equally challenging dilemma several times a day while we were there- what to eat? Now, it would seem that in the land of pain au chocolats, baguettes, french onion soup, macaroons, and butter galore, finding something to eat should be easy, right? I would like to believe so too. However, the city is fraught with pale imitations of these dining gems, luring innocent little tourists like me right into their bland, unremarkable traps. Our quest was to not only eat French food, but amazing, soul-expanding, epiphany-causing French food. On a budget, of course! 1. 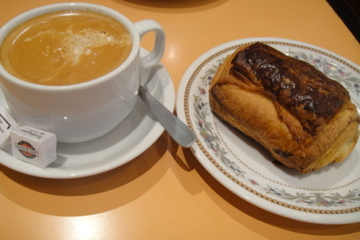 Let’s start with breakfast…at the Jean Millet patisserie. Julia and I managed to try a good amount of pain au chocolats and other various pastries on our trip, and we chose to come back Jean Millet for our last breakfast in Paris. The outer shell shatters into a million little butter-infused pieces, and the ratio of chocolate to pastry is perfect. If you’re searching for classics done right, look no further. What a wonderful way to greet the day! 3. Ok, ok, so although we could have fueled ourselves entirely on a bevy of Parisian sweets, we took a break for sanity’s, and our health’s, sake, to have some other kinds of food. Like fondue! Joanna, in the picture with me above, took us to a place that she said was very touristy but which I completely enjoyed despite the usual negative connotations that adjective usually holds. 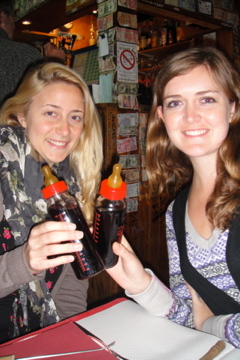 Le Refuge des Fondues is close to the Sacré Coeur, and came up with the creative solution of getting around a tax on wine served in stemmed glasses by perversely putting it in a baby bottle instead! It felt a little Twilight-esque with our blood-red bottles. Although neither the fondue, or wine, is out-of-this-world amazing, the funky atmosphere and fun dining experience make this place worth a visit! 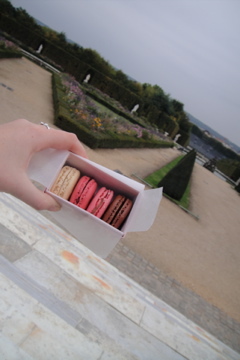 Out of the many, many dining out experiences we had in Paris, these are my taste bud highlights. I hope you had fun reading about them! Hi Jen! That’s so funny! I guess it’s a very popular spot, and I can see why- it’s so unique! Teaching is going well so far, congrats on finishing training! HOPE ALL IS GOING WELL AT SCHOOL!! LOOKS LIKE SUMMER IS FINALLY OVER HERE IN FLA. !!!! I so enjoy reading about the food. You had me at the Vanilla Bean Macaroon…and i didn’t gain a pound!!!!! PORTUGAL ;; HOPE YOU HAD FUN ANYWAY. Yes, the weather was even crazier than FL in the summer- it stormed on and off, but fortunately was still warm. We made the best of it! I’ll post about it soon so you can see some of our pics, it was beautiful! I did a little internet research and couldn’t find anything like a Spanish seafood stew. I’ve seen seafood paellas, and lots of seafood on its own, but I’ll have to keep my eyes out for something like you describe!